Picture - Spanish Dornier Do J "Plus Ultra"
The Dornier Do J was a twin-engine German flying boat of the 1920s designed by Dornier Flugzeugwerke. The Dornier Do J (later designated Do 16 by the Reich Air Ministry) was better known as the Wal ("whale"). The Do J was a fairly modern (compared to World War I types) flying boat with a high-mounted strut-braced monoplane wing. Two piston engines were mounted in tandem in a nacelle above the wing and in line with the hull; one engine drove a tractor propeller and the other drove a pusher propeller. The Do J made its maiden flight on 6 November 1922. The flight, as well as most of the production until 1932, took place in Italy because a lot of aviation activity in Germany was prohibited after World War I under the terms of the Treaty of Versailles. Dornier started producing Whales in Germany in 1931, with the production lasting to 1936. In the military version (Militx�rwal in German), a crew of two to four rode in an open cockpit near the nose of the hull. There were one MG-position in the bow in front of the cockpit and one to two amidships. Beginning with Spain, military versions were delivered to Argentina, Chile, the Netherlands for use in their colonies, Yugoslavia, the Soviet Union and to the end of the production Italy and Germany. The main military users, Spain and the Netherlands, manufactured their own versions under licence. Several countries, notably Italy, Norway, Portugal, Urugay, Great Britain and Germany, used the Wal for military raids. The civil version (Kabinenwal or Verkehrswal) had a cabin in the nose, offering space for up to 12 passengers, while the open cockpit was moved further aft. Main users of this version were Germany, Italy, Brazil, Colombia. 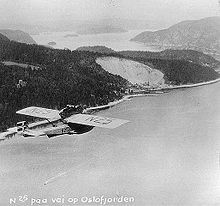 Picture - Amundsen's Dornier Do J flying over the Oslofjord, 1925. The Do J was first powered by two 265 kW (355 hp) Rolls-Royce Eagle IX engines. Later versions used nearly every available engine on the market from makers like Hispano-Suiza, Napier Lion, Lorraine-Dietrich, BMW, and even the Liberty Engine. The 10 to-Whales used by Lufthansa for their mail service across the South Atlantic fom 1934 to 1938 had a range of 3,600 km (2,240 mi), and a ceiling of 3,500 m (11,480 ft). Over 250 Wals were built by CMASA and Piaggio in Italy, CASA in Spain, Kawasaki in Japan, Aviolanda in the Netherlands, and Dornier in Germany. Numerous airlines operated Dornier Wals on scheduled passenger and mail services with great success. The source Gandt,1991 (pages 47-48) lists the following carriers: SANA and Aero Espresso of Italy; Aero Lloyd and Deutsche Luft Hansa of Germany; SCADTA of Columbia; Syndicato Condor of Brazil; Nihon Koku Yuso Kaisha of Japan. According to Nicolaou,1996 the Dornier Wal was "easily the greatest commercial success in the history of marine aviation". 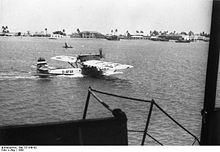 The Colombian Air Force used Dornier Wals in the Colombia-Peru War in 1932-1933. Picture - A Wal at Slite, Gotland, en route Danzig-Stockholm in the summer of 1925. The Norwegian polar explorer Roald Amundsen accompanied by Lincoln Ellsworth, pilot Hjalmar Riiser-Larsen, and three other team members used two Dornier seaplanes in his unsuccessful attempt to reach the North Pole in 1925. His two aircraft, N-24 and N-25, landed at 87� 44' north. It was the northernmost latitude reached by any aircraft up to that time. The planes landed a few miles apart without radio contact, yet the crews managed to reunite. One of the aircraft, the N-24 was damaged. Amundsen and his crew worked for over three weeks to prepare an airstrip to take off from ice. They shoveled 600 tons of ice while consuming only one pound (454 g) of daily food rations. In the end, six crew members were packed into the N-25. Riiser-Larsen took off, and they barely became airborne over the cracking ice. They returned triumphant when everyone thought they had been lost forever. On 18 August 1930, Wolfgang von Gronau started on a transatlantic flight in the same Dornier Wal (D-1422) Amundsen had flown, establishing the northern air route over the Atlantic flying Sylt(Germany)-Iceland-Greenland-Labrador-New York (4670 miles) in 47 flight hours. In 1932 Wolfgang von Gronau flew a Dornier Wal (D-2053) called the "Grx�nland Wal" (Greenland Whale) on a round-the-world flight. In 1926 Ramx�n Franco became a national Spanish hero when he piloted the Dornier Plus Ultra on a trans-Atlantic flight. His co-pilot was Julio Ruiz de Alda Miqueleiz; the other crew members were Teniente de Navio (Navy Lieutenant) Juan Manuel Duran and the mechanic Pablo Rada. The Plus Ultra departed from Palos de la Frontera, in Huelva, Spain on 22 January and arrived in Buenos Aires, Argentina on 26 January. It stopped over at Gran Canaria, Cape Verde, Pernambuco, Rio de Janeiro and Montevideo. The 10,270 km journey was completed in 59 hours and 39 minutes. In 1929 Franco attempted another trans-Atlantic flight, this time crashing the airplane to the sea near the Azores. The crew was rescued days later by the aircraft carrier Eagle of the British Royal Navy. The Portuguese military aviator Sarmento de Beires and his crew made the first night aerial crossing of the South Atlantic in a Dornier J named Argos. The crossing was made on the night of 17 March 1927 from Portuguese Guinea to Brazil. Two Dornier Wals (D-ALOX Passat and D-AKER Boreas) also played an important role in the Third German Antarctic Expedition of 1939. The biggest and last versions of the Wal, the 8-tonne Wal and 10-tonne Wal (both versions also known as Katapultwal ), were operated by Deutsche Lufthansa on their South Atlantic Airmail service from Stuttgart, Germany to Natal, Brazil. On route proving flights in 1933, and scheduled service beginning in February 1934, Wals flew the trans-ocean sector of the route, between Bathurst, The Gambia in West Africa and Fernando de Noronha an island group off South America. Launched by catapult from converted merchant ships. The Wals had to be catapulted due to the sea states in the mid-Atlantic and because they could not take off from the water under their own power with enough fuel to fly the distance. The first merchant converted as a mid-Atlantic refueling stop was the Westfalen a passenger liner which became out dated shortly after World War One to carry mail and passengers due to its small size and cruising speed. Wals made over 300 crossings of the South Atlantic in regular mail service. (Gandt, 1991, pages 47-48) The 8-tonne Wal was not a success, only two being built. The six 10-tonne Wals remained in use on the South Atlantic until 1938, although aircraft of more recent design began replacing them from 1937. From 1925 the French airline Compagnie G�n�rale A�ropostale operated an airmail service on much the same route, from France to Brazil. Originally the mail was flown only as far as Dakar in West Africa, and then shipped across the South Atlantic by steamer. In 1930 the A�ropostale began making ocean crossings by air, but was not able to fly regularly because their planes were too unreliable. Air France, which A�ropostale had become a part of, only began operating a regular all air service from Europe to South America in December 1935, nearly two years after Lufthansa (if we can trust the information on the Transatlantic flight page). That Lufthansa succeeded, where A�ropostale failed, in establishing the worlds first regular intercontinental airline service, was due in no small part to the Wals reliability, ruggedness and seaworthyness.